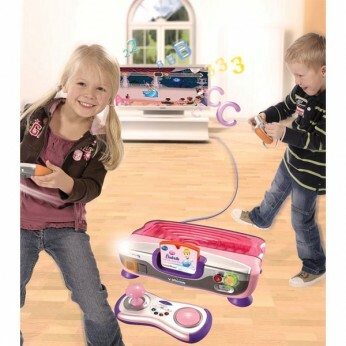 Next generation pre-school TV learning console, complete with motion sensing wireless controller. Accompanied by Cinderella Learning Game introducing directions, shapes, vocabulary, numbers, logic, spelling and more. Compatible with the extensive library of popular V.Smile Motion Learning Games that teach age appropriate curriculum through fantastic game-play! This toy costs approximately £19.99 (for the latest and best prices make sure you check our retailer list for the V.Smile Motion Active Learning System Pink above). In our review of V.Smile Motion Active Learning System Pink we classed it as being suitable for ages 3 years, 4 years, 5 years but recommend you check the manufacturer specific advice before purchasing.